Many large schools not only have cheerleaders, but also pom girls, dance teams, booster clubs, and school mascots. Mascots add levity, excitement and interest to games and pep rallies. The mascot plays an important and vital role to any spirit department. The school mascot is typically a symbol of pride for the school. Mascots tend to be either animals or warrior type characters. For example, schools have been known to have everything from bears to "braves", and even some more bizarre mascots like a Saluki or an orange. The mascot typically appears in clip art form on any stationary from the athletic department of the school. Mascots are part of the spirit squad or cheerleading department. Several students traditionally play the mascot, especially in the case of university mascots. High schools often choose one or two students to represent the school through the mascot uniform. What Does a Mascot Do Exactly? A school mascot is a unique member of the cheer team in that he cannot cheer or yell as the costume is typically very prohibitive. Instead, mascots provide a different type of opportunity to excite the crowd and get everyone ready for cheering on their favorite team. Mascots typically dance, throw candy into the stands, and may do the motions to some cheers in exaggerated form. They also provide some relief to the cheerleaders if there is a lull in the game and they are not prepared with a cheer. What makes being a mascot so fun is that unlike cheerleaders, mascots don't have to follow certain rules about when to cheer or how to cheer. Mascots can run through the crowd in the bleachers, do a few tumbling moves pre-game, or exaggerate cheer motions and cheers along with the cheerleaders. Mascots are generally very funny and have a way of getting the crowd to respond. How Do You Become a School Mascot? School mascot tryouts are usually held around the same time as cheerleader and dance squad tryouts. There is normally an application where you'll need to write about why you want to be a school mascot and there is often an interview. Coaches want to know that you will be enthusiastic about supporting the team and be able to get along with everyone in the department. Mascots in many ways need to be outstanding performers and have a really outgoing personality in order to pull off the type of antics that will get a crowd excited about the game. 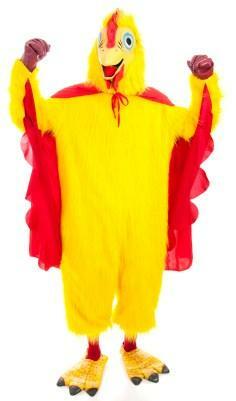 In addition, school mascots need to be able to bear the weight and heat of the mascot costume. While mascots don't have to do the type of tumbling and routines that cheerleaders do, they do have to be able to dance and maneuver in the mascot costume. Should You Become a Mascot? Self-confidence in performing comedy: Remember, as the mascot, you won't be doing the smooth routines of the cheerleaders. Instead, you'll be doing things to make the crowd laugh, offering foolish and what some may see as embarrassing antics on the floor. Mascots can't be afraid to really put themselves out there. Strength and agility: Mascot costumes can be difficult to wear. The wearer cannot be claustrophobic and must be comfortable performing with the added weight. A team player: It's important that a mascot doesn't see himself as an entity on his own but rather as part of the squad. The goal of the mascot isn't to detract from what the cheerleaders are doing but rather enhance their performance. Being a mascot is a lot of fun but it is also a lot of hard work. Just like cheerleaders, mascots have to practice, learn routines, and support the athletes.